Manchester United beat Tottenham Hotspur 2-1 in the semi-finals of the FA Cup, and booked another date at Wembley on May 19 against Chelsea. The match on Saturday saw Spurs score the opening goal early in the first half, before Alexis Sanchez bagged the crucial equaliser for the Red Devils. That, in turn, saw Jose Mourinho not celebrating the moment, but instead, he chose to pass vital information to his players. He called over left-back Ashley Young and midfielder Ander Herrera to pass on a message. United, from there on, rallied on and soaked in the pressure from Spurs, before Herrera scored the winner with a sublime finish. 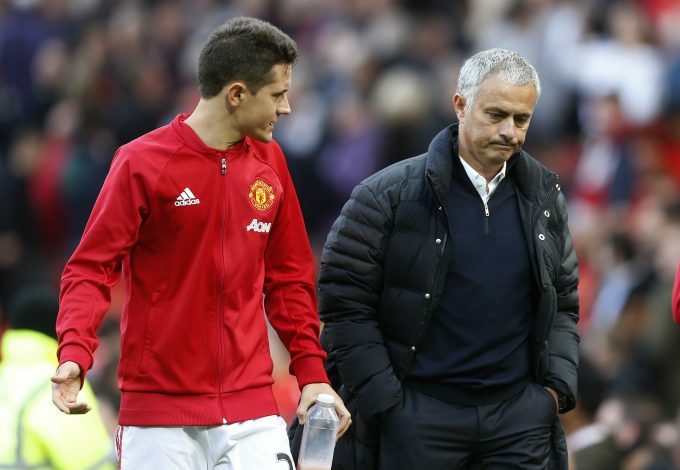 According to a report in Daily Star, a source close to Mourinho has revealed that the manager called the duo to ensure that the players did not give the desired space to creative opposition midfielders, Dele Alli and Christian Eriksen. Both the players were responsible for their side’s opening goal, which saw the Danish player making a beautiful cross for Alli, who in turn, slotted the ball into the net past David De Gea. But Mourinho’s words following the equalizer sure did the trick, as United appeared livelier and did not commit the same mistake again. They closed in the spaces between midfield and defence, which did not allow the opponents to build on. The Red Devils ensured they played a better second-half and kept the Spurs attack at bay by limiting them to half-chances. The second-placed side in the league now eyes a third trophy under Jose Mourinho in two years.